The events and responses to the September 11, 2001, attacks prompted the implementation of more advanced Emergency Preparedness programs and measures. Today, the Public Health Emergency Preparedness Division works with local, state and federal programs and entities to ensure safe measures and best practices are being followed prior to, during and after an emergency. In the event of an emergency, plans have been created to help a community recover from that emergency more quickly. The department is trained in, and utilizes, the Incident Command System (ICS), as well as National Incident Management System (NIMS), to provide an efficient and standardized approach to the management of an incident. The Public Health Emergency Preparedness Division for Southwest Central North Dakota focuses on planning, training and conducting preparedness exercises for all potential public health-related emergencies in the region such as bioterrorism, pandemic flu and natural disasters. 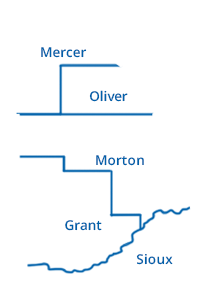 There are four Public Health units in this region including Custer Health, Bismarck-Burleigh Public Health, Emmons County Public Health, and Kidder County District Health Unit. You can reach the SWC ND Emergency Preparedness Division by phone at (701) 355-1546 for educational information on preparing for public health emergencies at home and at work. General preparedness materials and resources can be found through the North Dakota Department of Health's Emergency Preparedness and Response, through the North Dakota Department of Emergency Services (NDDES) or Centers for Disease Control and Prevention (CDC). Would a preparedness presentation be useful for your group or organization? Our staff will present an all-hazards approach for individuals in attendance, but can also focus on a number of specific preparedness topics to accommodate your small-to-large group. Click on this link to download our presentation informational form or contact us for more information. These presentations can be as short as 10-15 minutes, or as long as 30-45 minutes. Send completed forms to SWC EPR Regional Coordinator Crystalynn Kuntz or SWC EPR Information Specialist Kalen Ost.